Mulling over a few things today, prompted a little by the welfare reform report and various opinion and news pieces generated by it, along with discussion by friends about the good and the bad of the proposals and their potential to help and hinder those needing support. I also, just now, realised that it’s been over 3 years now since I’ve had full time work. On the back of huge issues from anxiety (and a not yet diagnosed personality disorder) I resigned from my last full time work – a twelve month contract – in February 2012. I spent six months kinda looking for work, not sure if I was ready, and then picked up two part time gigs – a 17 hour a week contract and some casual private practice work – around September. I juggled these, having my first hospital stays, for 12 and 18 months respectively, resigning from one due to my crazy levels of stress around it all, and then was “let go” at the end of 2013 from the other, due to erratic performance, all strongly influenced by my difficulties managing my anxiety and stress and general erratic behaviour. I’ve been lucky enough that my ex insisted on my saving money, and having that to fall back on the first gap period, and also receiving or separation settlement at the start of my current blank period. Which also aligned with my sister’s suicide attempt, so I had bigger issues to focus on rather than my own for the start of 2014. Helping her and her kids stay healthy took to fore, and I could justify my blase attitude to reentering the workforce. It was “ok” because I was helping someone else and not just myself. I started looking at work again mid year. Applied for some things, confident that I could talk my way into them, like I had in the last positions…. but my past failures were starting to weigh me down. Initially, it was always framed as them having someone else, who had more experience, or lived in the area already, and that was okay. Then I started to see jobs I applied for being re-advertised, and being told that I’m just not operating at a senior enough level for their position. When they re-advertise by don’t call or email you first? That’s the worst. So, I got on “the dole” in July. Meeting my requirements, applying for any speech or related job I could find, local or not. Then bringing it back, realising that I probably SHOULDN’T move away from Newcastle anyway, or at least not too far. This is my home. My safe home base. So I broadened what I was looking for, but haven’t got a foot in. I get the occasional speechie interview still, on the back of my apparent experience and well written applications. But that’s as far as it goes. I’m still seeing a psychologist weekly, though that will end soon. I have a need to help family and others – I can’t help myself. And I doubt that I’m anywhere near capable of working full time even if I do get a gig doing something mind-numbing let alone something with responsibility like speech or as a carer. So I always wonder on why, if all I’m gonna get to is part time work, then why are my requirements for Centrelink all assuming that I’m able to job search or complete tasks and courses full time? I’m told I will be reviewed and possibly offered more support along these lines, like access to courses for free or something. But the poor girl who has my case is stressed and overworked herself (and shares my diagnosis!) and there is so much just ticking off done. I don’t get any money in for the company being university educated I should be able to fend for myself. It’ll happen, but I’m just happy to get out of there rather than have to dredge up crappy things when I’m in a good space in order to beg for more help. I don’t know where I’m going with this. I just wanted to ramble and say that it’s hard. Yes, people tell me to get a retail or hospitality job to fill in time, but they’re just as hard to break into as any industry, and I always get the thanks but no thanks, along with the assumption I’m gonna pick up and leave on them. Oh, and I tried to get a role volunteering with at risk kids, but one of their eligibility requirements was not having been hospitalised for a mental illness in the last 3 years. They said I could get a clearance letter from a psychiatrist, but that’s all too hard right now. here’s my cool possums. They are awesome. 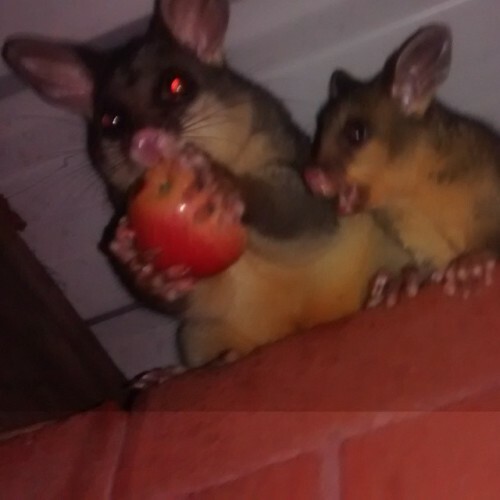 The live up in my roof and we give them apples each night. If we forget, they rattle the gate for attention. I think we can all only do our best given our constraints and circumstances. Take things one at a time, but never take yourself off your priority list. Helping your sister and her kids is definitely important but remember that you will eventually need to focus on yourself and rebuild. And the biggest thing, remember you can always ask someone, somewhere, for help. they gave me a nice valid distraction. I also have a bf who needs help, again a nice valid distraction. I will come back to me, but keep avoiding!!! I did a lot of volunteering with kids and it was hard as I get very involved emotionally. But I found it easier to volunteer in a dog walking program, it’s also rewarding and fun. Hope this idea helps.